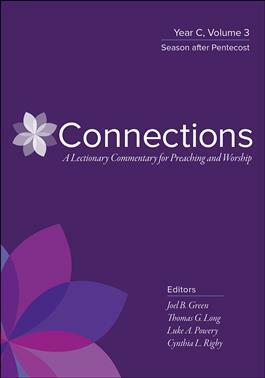 Designed to empower preachers as they lead their congregations to connect their lives to Scripture, Connections features a broad set of interpretive tools that provide commentary and worship aids on the Revised Common Lectionary. For each worship day within the three-year lectionary cycle, the commentaries in Connections link the individual lection reading with Scripture as a whole as well as to the larger world. In addition, Connections places each Psalm reading in conversation with the other lections for the day to highlight the themes of the liturgical season. Finally, sidebars offer additional connections to Scripture for each Sunday or worship day. This nine-volume series is a practical, constructive, and valuable resource for preachers who seek to help congregations connect more closely with Scripture. This volume covers Year C for the season after Pentecost.